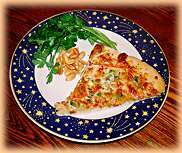 Make fabulous pizza at home. Our pizza making primer shows you all you need to know to get great results the entire family will eat up. Ask just about anybody what their favorite food is. I can guarantee that one of the top three is likely to be pizza. Everyone loves pizza and everyone has different opinions about pizza. Thin or thick crust? What toppings? New York, California or Chicago style? Small, Medium or Large? Even pick-up or delivery? Now you can have your very own opinion,options and your very own pizza! 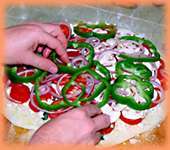 This article is intended to give you the basics of pizza preparation, condiments and cooking equipment. Pizza is very forgiving. It really doesn't care what you put on it or where you cook it. I've even made it on a barbecue! So don't worry and just have fun with it. Food processor - this is probably the most useful (although you can get by without it) piece of equipment. Rolling pin - for those who don't want to toss the dough. Baking stone or bricks - a heavy duty baking sheet can be used instead. Pizza peel - paddle like tool for removing pizza from the oven - a couple of spatulas will work fine too. Pizza cutter - don't have one? Use a big knife. Bread flour is what I use, it produces a dough that's a little thicker, lighter and fluffier. If you prefer a thinner and crisper crust, use regular flour. 2. Make the sauce (not always necessary). Some pizzas have sauces some don't. Not only does a sauce add flavor, it helps keep the cheese on the pizza. 3. Cut the cheese (Not the way you're thinking, Beavis!). Cheese is probably the single most important ingredient. Don't be cheap when it comes to buying cheese. Buy fresh, whole cheeses. You and your taste buds will be glad you did. It's OK to grate the cheese in advance (I use the food processor for this) and keep refrigerated or frozen for later use. I like to have all the toppings cut and ready prior to assembly. This makes the assembly fast, which is important. 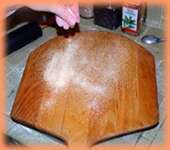 Place the dough on a cookie sheet or on your pizza peel. If using a peel, first sprinkle it with a little corn meal. The cornmeal acts like tiny "ball bearings" that helps the pizza to slide off into the oven. Put the sauce on leaving a quarter to half inch border around the edge. This gives your pizza that pizzeria look. Cover with cheese. Also leaving a quarter to half inch border. Place toppings on top. Put pizza in a 450° F. degree oven for about 15 minutes or until the crust is golden brown. If you are using a pizza stone or bricks, always sprinkle corn meal on stone just before the pizza goes in. This helps the pizza not to stick here too. Remove and let cool on cooling rack for 10 minutes. If you don't let it cool a bit before cutting the molten hot cheese will flow like lava off your pizza and on to your counter. 7. Slice it up and share with family and friends. Slice it up any way you like and be sure to have enough people around to tell you how great it is. Every pizza is pretty much made the same way. 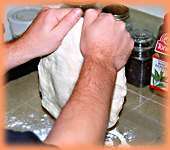 Any technique unique to a particular pizza will be described within the recipe. 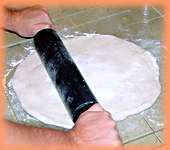 Click to Page 2 for detailed photo instructions of how to roll out pizza dough. One mistake most people make when working with dough is not using enough muscle. Dough fights back. You push it, it pushes back. Don't be afraid of the dough. It won't bite you and you can't really damage it, either. When working with dough, use plenty of flour, but don't let it get too dry. It should be fun to work with, not too sticky and not too crumbly. Form it into a flat ball about six to eight inches wide. 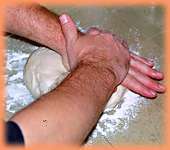 Using both hands, one on top of the other, press from the center outwards on it to start stretching it out, turning the dough a bit on each push. 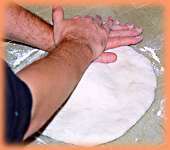 You can also pick up the dough and squeeze the edges of it while turning it like a steering wheel. This allows the weight of the dough to stretch it. Once the dough is about 1/2" thick all the way around, use a rolling pin to flatten it out to about 1/4" thick. I usually run the pin over once or twice, flip the dough over and give it a quarter turn and roll it again to make it even. Take a fork and put puncture holes all over the dough. This keeps it from bubbling up while cooking and it also helps to hold the sauce on as well. 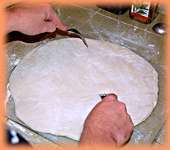 Transfer dough to pizza peal sprinkled corn meal or place it on a lightly greased cookie sheet. Top with sauce, cheese and/or toppings and bake in a 400° F. oven until the crust is light brown. Bake on either baking stones or on the cookie sheet or a pizza pan.